The stoner rock tunes of Dead Meadow at The Troubadour make for a great Valentine’s Day. They’re dreamy. They’re mellow. It’s oh so dreary. There were couples all around the venue, waiting for the mellow stylings of the band. Of course, the show was not without its share of lonely folk staring at their phones (myself included). 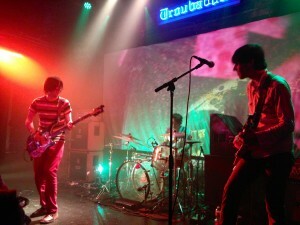 Nevertheless, all three members of Dead Meadow approached the stage after a flurry of fog surrounded the audience. The band, who is currently on a California mini-tour promoting their latest album, came out and first played in very introverted fashion. All three band members seemed focused on their respective instruments as they began playing their psychedelic pop sound with a mix of heavy fuzz. The trance was apparent. As the show went on, the band members’ demeanors did not change. So focused on their instruments, over time Dead Meadow was keeping a secret from its audience. It really created a sense of wonder throughout the each Sabbath-inspired track. But later on in the set, each bandmates slowly got into their own rhythm, acknowledging each other. As that happened, the tempo gradually worked its way up. the haze and the raw power of the guitar transitioned to a more psychedelically melodic change of pace. The final song became a trio of solos that lasted around fifteen minutes. It left the audience in a state of shock and haziness, which is almost like falling in love. Fitting, right? Catch Dead Meadow on the rest of their California tour or be on the lookout for their latest album, Warble Womb, out on Xemu in conjunction with The End Records.